Well, not to be accused of having little to no follow through, I should talk about the Mrs Stylebook Sloper Along, right? I emailed the original scanner of the slopers and did not hear back. So, I’m opening them up to the world. Please go here to Downloads and select your size. I had mine printed up in the office print shop. But, you can take to Kinkos or such and tell them to print at 100 percent. I’ll post a timeline over the weekend. The plan is to work on our slopers and then jointly make the same simple dress using the drafting schematic from a Mrs. Stylebook. I’ve written suggested supplies here. And now, I am off to pre-shrink wool. I head to NY tomorrow for a quick trip. My shopping list is just embarassing at this point. And, of course, if there are any experienced MSB drafter or Japanese speakers who want to volunteer as this will be the blind leading the blind, I am not too proud to accept your help! Next Post Supplex. Who Knew? I downloaded both of them. It looks like I am on the borderline between the two bust sizes. This is very exciting. I have been wanting to learn pattern drafting. Is posting the scan a copyright violation? Who knows. Maybe. I’ve never grasped the rules. I figure it’s available in the magazines so as long as everyone participating buys a magazine my conscience is clear. I am in. I have never done a sew along before. Hopefully I won’t alienate all the other sew along participants. I have the slopers in the magazine from summer of 09 when they published them, so I guess I’m set. Ooooh, how timely. I’ve been thinking I really need to make me a sloper. Can we assume it’s high bust, not full? I’d love it if you were to do a run of this game in time for producing a Christmas party dress… but understand if it would be impossible. Yes. According to the photo in the magazine it is high bust. The Bunka books show them adjusting for a full bust separately. Well, I’m in. I’m still obsessing over slopers and dressforms so…it’s on! And January isn’t too far. As for sewing over the hollidays, since my immediate family has moved out of the country massively in the last few years, I guess I’m going to have a sew-a-thon myself, LOL! me again. the pic with the photos comes out seriously small or blurry when I make a full page. Am I doing something wrong? It won’t print full size on 8 x 11. I meant full size 100 pecent. It comes out to be… 2 ft by 3 ft? Ok, sorry, it was time for lunch and that was inintelligible, LOL! I meant that the photo with the instructions comes out blurry on 8×11 but the second one with the actual slopper is perfectly clear. I’m refering, of course, to the downloads on the other page. I’ll figure it out. I have only one page w/ a front and a back. There are instructions? I was actually refering to the instructions pas shown on the Tools post. The already made-up sloper downloads easily. ahh. I see. Those are for drafting from scratch. This project we’ll use the pre-drafted sloper. 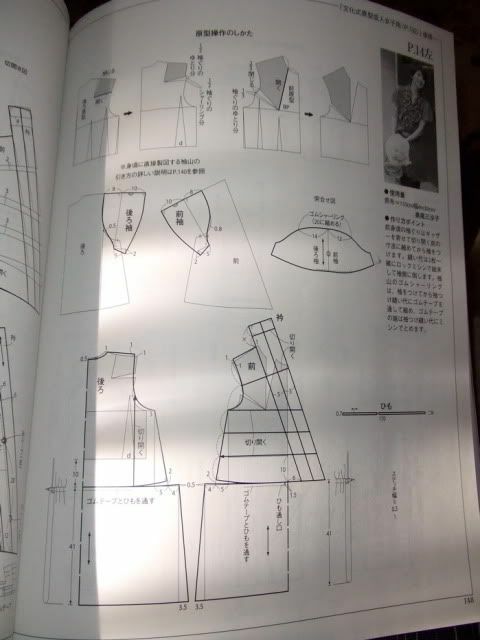 I will though, talk about some alterations using the Bunka textbook as a guide. Oh, I see, thanks. I’ve never used a fitting pattern, which is what this is, but I think the standard ones (from the Big Four) have instructions. No instructions and no seam allowance on the sloper there. I’m going to use a size zipper for fitting.